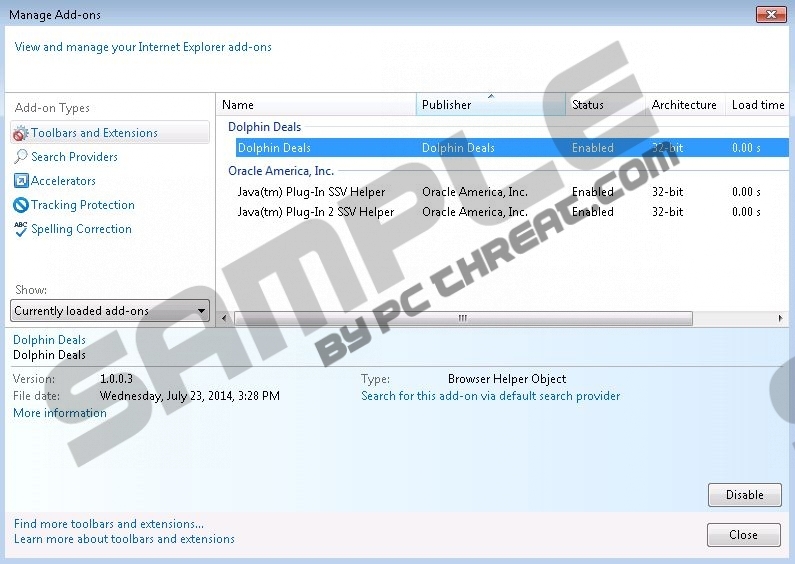 Dolphin Deals Ads is yet another adware application developed by the infamous SuperWeb LLC group. The dubious developers are known to have developed some of the most annoying adware applications out there; the list includes Cantataweb, ZoneTrek, Okiitan, KingBrowse, Mobeema and a lot of others. You are firmly advised to remove Dolphin Deals Ads or any other application that has been mentioned. Dolphin Deals Ads is marketed as a useful tool that will aid you with various deals and offers while shopping online. In reality, the provided ads are virtually worthless. Furthermore, it is well-known that quite a few adware applications are linked to other internet-based infections. If virtual security is your utmost priority, you should implement a reliable antimalware system to avoid any dubious application from entering your PC. Once Dolphin Deals Ads infiltrates your operating system it will install browser extensions to all the popular browsers on the market (Mozilla Firefox, Internet Explorer, and Google Chrome). These extensions are used to provide numerous worthless adverts while you browse the web whether you like it or not. Furthermore, these extensions are capable of updating themselves automatically. Thus, it is safe to assume that the adware application is updated trough them as well. In some cases, ads provided by Dolphin Deals Ads or any other adware program could turn out to be implemented with a redirect link. If you click on such advert, you will be redirected to a possibly malicious or corrupted website. Sometimes cybercriminals setup fake web stores in order to steal sensitive data. For instance, you could land on a website that provides certain goods for a very low price. That might be very tempting but in reality it is nothing more than a hoax. Be very careful if you encounter an online store that you are unfamiliar with. Learn as much as possible before purchasing anything from it. It is a firm reason to remove Dolphin Deals Ads ASAP. In most cases, adware applications are distributed via bundled freeware. Dolphin Deals Ads is no exception since the direct download link on the official website does not work. Various installers that are filled with suspicious applications are provided on dubious third-party hosting websites. In order to avoid such installers and websites, you ought to install a reliable malware detection and removal tool. Such tools can identify and delete any potential virtual threat instantly. Furthermore, they provide real-time security to your PC. Removal of Dolphin Deals Ads is not all that tricky. Uninstalling the application via Control Panel does the trick most of the time. But just to be on the safe side you are advised to check your PC for any possible leftovers of the infection. Use the provided list of files, folders and registry entries associated with Dolphin Deals Ads for that. Otherwise, you are recommended to use a trustworthy antimalware tool for removal of Dolphin Deals Ads or any other internet-based infection. Type Control Panel into the text box. Uninstall Dolphin Deals by double-clicking on it. Tap the Windows +Q keys simultaneously. Select Dolphin Deals and click Uninstall. Select and remove Dolphin Deals. Quick & tested solution for Dolphin Deals Ads removal.